BTS have over 29m Twitter followers and have conquered North America, Japan and China (yesterday they were the first K-pop band to win an AMA), but the UK, with its customary pickiness when it comes to pop culture, has been one of the last to fall to K-pop’s hallyu tidal wave – or more accurately, the BTS tidal wave. What’s creeping up on us, though, is the Bangtan Boys’ mixture of old-school hip hop, 80s new romantic imagery, LGBT-friendly politics and intoxicating R&B pop. Also, not many K-pop bands reference Herman Hesse, Ursula Le Guin and Debussy in their music. 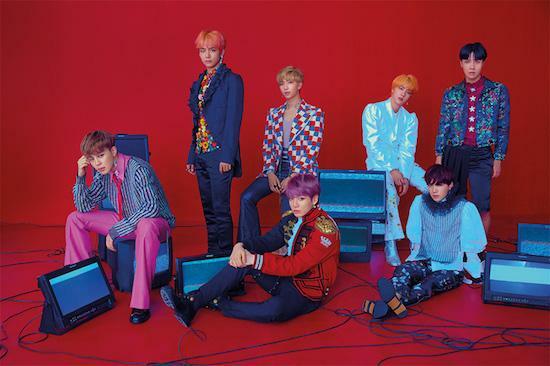 Cultivated on independent label Big Hit Entertainment as an antidote to the regimented ranks of formulaic K-pop, BTS are moving the genre forward, co-writing all their songs with a vivid creativity. The video for their recent single ‘Fake Love’ – featuring art-pop filters, dramatic flames and floods – garnered 4.8 million views in its first hour. Their latest album Love Yourself: Tear debuted at number 1 in the Billboard charts, becoming the highest-charting ever album in the US by an Asian act. BTS are followed by a dedicated and articulate global army, who have been tweeting about the Love Yourself tour for months. In June tickets for the London dates sold out within minutes, and were being resold for up to £1000 each. The O2 Arena tonight is packed with army fans (mainly girls in their late teens and early 20s), wielding spherical bluetooth lights (£47 a pop, with batteries), and shouting fanchants. For this opening date of their first European tour, expectations are blisteringly high. And they do indeed. Before the show UK army fans had been joking on Twitter that they would turn BTS into roadmen with hoodies, going back home saying ‘mandem’. After a video interlude the group return with more vigour, featuring J-Hope’s solo performance of ‘Just Dance’. With his easy charm and fluid grace, J-Hope is the band’s strongest dancer (it was his loping moves to Drake’s ‘In This Feeling’ car challenge that went viral this summer). Along with RM and Suga, he is also one of BTS’ main rappers, and as the band join him they are more relaxed and comfortable, moving and responding to the crowd. When the group started out in 2014 they spent a while in LA studying with bad old boys of G-funk like Coolio, Dante and Warren G, and that love of old-school hip hop is there in BTS’ rapidfire delivery and vocal interplay. RM in particular holds the stage like a trickster showman in his harlequin-checked jacket, while the others weave around him singing expressive, alt soul vocals. The show is about a search for self-identity. After two-and-a-half hours of costume changes, pulsing beats, soaring high notes and the impossible iconic beauty of their videos, BTS walk to the front of the stage in low-key jeans and T-shirts. The house lights are turned up and they look at the crowd. “We wanted to see you,” says RM. Each member talks to the audience in turn, some in Korean, some in halting English. Jungkook says he has let everyone down with his injured ankle and when the crowd chant back at him in Korean “Gwenchana” (“It’s okay”) he breaks down and cries. This personal encore is unexpectedly tender. BTS are different, and strangely moving. As they sing the last song, ‘Anpanman’, which is about a new kind of superhero, we realise that their awkwardness and sensitivity is also the source of their strength.